HowMechanismWorks ? : How Capacity of Absorption Chillers Can Be Controlled ? How Capacity of Absorption Chillers Can Be Controlled ? Capacity of absorption chillers needs to be adjusted with respect to load on HVAC water chillers.Capacity control of HVAC chillers is very logical and required to save the input energy at low or part-load on chillers. Chillers providing absorption cooling use different types of input energy.Absorption chillers are generally controlled from input energy being provided to generator(single effect absorption chillers) or high pressure generator (double effect absorption chillers). 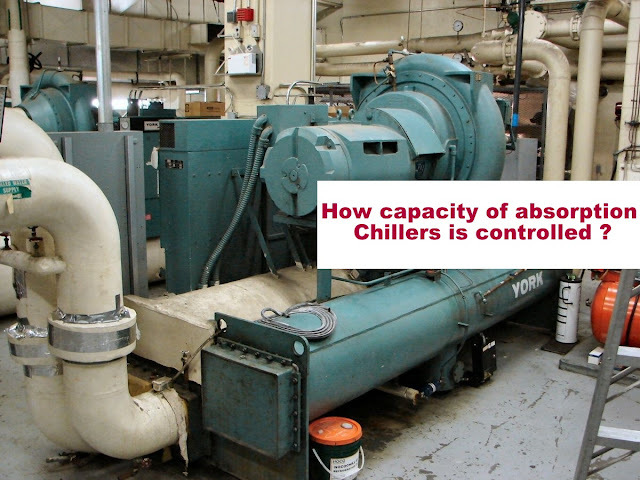 How capacity of absorption Chillers is controlled ? Capacity of absorption chillers is controlled by varying the input thermal energy to generator.While input thermal energy to absorption chillers is regulated with reference to load on chillers .Suppose load on absorption chillers changes then the outlet temperature of chilled water will also be changed little and this is generally sensed by chiller instrumentation.Chiller controller now regulates the valve of thermal energy with respect to the change in thermal load. As load decreases chilled water temperature decreases .When chilled water temperature decreases below predetermined set point,gas valve (in case of direct fired chillers) will start closing accordingly . As burner fire rate or steam flow rate is modulated chilled water temperature will be changed accordingly.This decrease in load would cause closing of steam inlet valve in case of steam operated absorption chiller (indirect fired chillers). This closing of valve will reduce the heat input to generator of absorption chillers and temperature in generator will be reduced. By this technique of capacity modulation,heat input to chiller is lowered in generator so accordingly less vapors of refrigerant (water in lithium bromide chillers) will be produced .These vapor get condensed in condenser of chiller and finally reach the evaporator of chiller at lower pressure.Now because less vapors reach evaporator so less heat will be extracted from chilled water and refrigeration effect will be reduced and chilled water temperature will increase accordingly. Generally between 30 and 100 percent of the hvac system design refrigeration load, the burner fired rate is modulated. Below 30 percent of design hvac load, the burner is cycled on and off, and all refrigerant and solution pumps remain. On the other hand ,concentration of solution reaching the absorber from generator will drop accordingly.In other words as less thermal energy is supplied to generator of chillers, solution reaching the absorber will be less strong as it would still contain some refrigerant. This little less strong solution will have less capacity to absorb refrigerant vapors as compared to strong solution.So accordingly more vapors will remain in evaporator and would increase the evaporating temperature and pressure in evaporator of absorption chiller. Finally a new balance will be established between gas inlet valve and load to achieve the preset temperature at outlet of evaporator. Similarly if load on hvac absorption chiller increases then chilled water temperature will also be increased accordingly.Chiller need to be adjusted in accordance with this new load value.Gas valve or steam inlet valve will be opened more to adjust the refrigeration effect and load on chiller.Rest of effect will be inverse of load decrease.